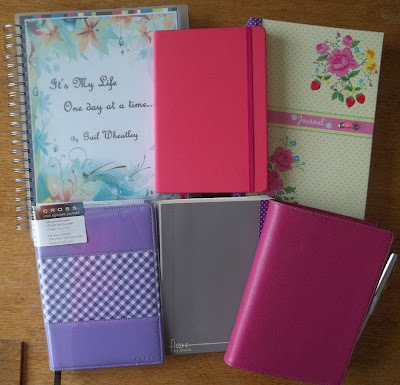 My life with Filofax and other stuff! I posted a pic of my Personal size Touch Me Van Der Spek on Facebook and the tabs generated a lot of interest. So I thought I would share how I made them. They're very simple and cost me the price of a pack of white stickers. You will need 2 sets of A-Z Filofax tabs. 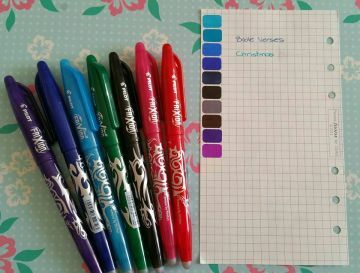 Pack of coloured Sharpies or felt tip pens. Pack of Small white stickers. I simply coloured 3 stickers in each colour. 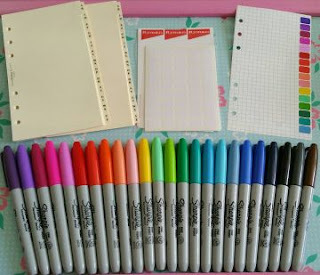 Placed one colour on each side of the divider to hide the letter and one colour on a sheet of paper to make an index. I use Frixion pens on the Index, so if I change anything around I can erase the index as and when needed. This morning I took delivery of a A5 Fusion Filofax in Black. This retails at £56 at Filofax UK and is quite a decent planner for the price. It's made of a Micro fibre, similar to backpack material, but it feels very hard wearing. And the strap is made of leather too. Just look at the length of this strap though, you can tell, this Filofax will hold some stuff. The front also has two pockets, ideal if you want to carry tickets etc. or something you need to get to quickly. The back also has a full length pocket. Inside, there are 6 credit card pockets and a larger pocket with a side elasticised gusset, so it will stretch. Ideal to keep your mobile telephone in. The Dividers in this one are different colours, very Autumn/Fall colours. Inside the back cover is a pocket to fit a notepad. The Fusion has bigger rings too, 30mm, so with that long leather strap, this is going to be able to hold a great deal of stuff. Personally, I think the Fusion is a very "manly" Filofax, but would appeal to anyone who wants to really stuff their organiser. I can't wait to start using it. I would also like to thank Jessica from The Ideas Network for allowing me to review this lovely organiser. 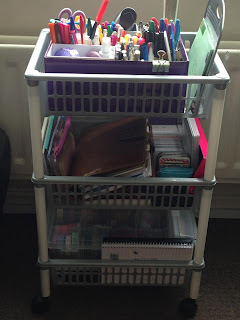 Just a quick blog today to show how I am storing my Filofax Journal and washi tape supplies. I was using a tote, but it was getting a little heavy to carry, so now, I can wheel my stationery about. I got my idea from Scrapbook/Craft Organization Ideas. 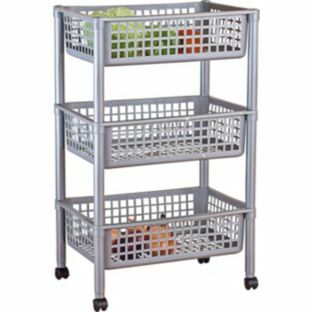 A lot of the members use this Trolley from Ikea, but at £50, I thought it was a little expensive. It's working pretty well so far and best of all, it cost me less than £9 from Argos. I would love to hear how you store or carry your own supplies. Jess from Ideas Network, sent me this lovely A5 Calipso to review this week. This a a beautiful leather organiser, which has a lovely squishy feel to it and retails at £90. The closure is mock crocodile leather. Inside is one full length pocket with 6 credit card pockets on the left. It also has an elasticised pen loop in matching colour. To do and White lined paper. The remainder of this year's Week on two Page Diary and a clear Page marker. The back has a full length zipped Pocket. The A5 Calipso is a lovely Organiser. Compared to some of the other organisers in the same price range, this is a lovely simple piece. Simple lines and not a lot of pockets, but just enough to keep you happy. .... the reason why this is, is the small closure strap. It's not very long, so this stops you from putting lots in it. You can see from the picture below that it is causing a bit of a warping effect. 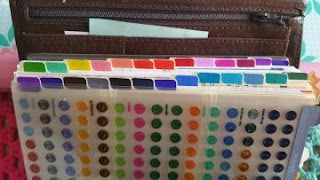 Maybe Filofax could address this little problem for future organisers. But overall, this is a beautiful Filofax, the colour is a lovely pink, much nicer than the Fluro Original. 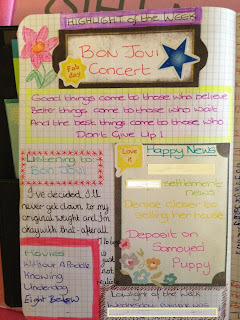 I've changed my journaling yet again! Most of you who know me, will see I've had a right dilemma with my Journaling in the past, I've had so many changes. You can read about them here , here and here. It's a lot isn't it! Then at the beginning of June, I thought, that's it, I need to get a grip on this and decided to use a lovely notebook from Paper chase, this fit snugly in my black Filofax Flex. 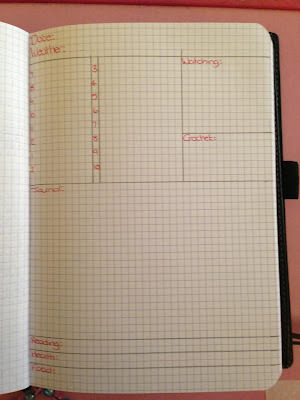 I drew a daily grid of what I wanted to fill in and it was working well. The Paper Chase grid notebook comes with 300 pages (600 sides), so that's a lot of journaling! 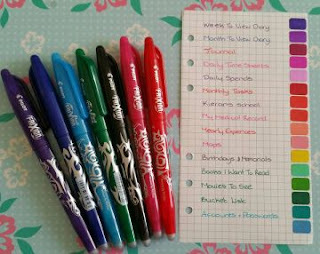 I decided to add some extras to my journals, notes, weekly events, quotes, jokes, fun facts etc. And I really liked how it was looking. Then doubt kicked in! 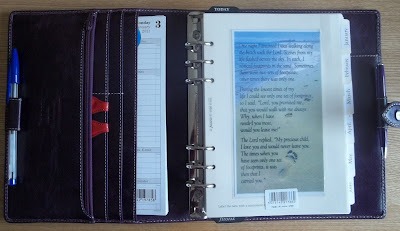 I liked how things were going, but I didn't like the joint daily journaling and scrapbook journal mixing. I use my past journals to see what I was up to in previous years and I thought, I am going to have to wade through pages and pages to find stuff. So another journal idea was needed. This is what I came up with this time. A set of three B5 Kraft Notebooks from Waterstones. Each book holds 30 pages (so some months, I am going to have to add another page). Again I made my own page templates to fill in each day. This is my daily journal. So for my scrap booking journal, I went back to using a Martha Stewart Premium Journal (8x10). This is bigger than my A5 notebook so I can get a lot more in it. 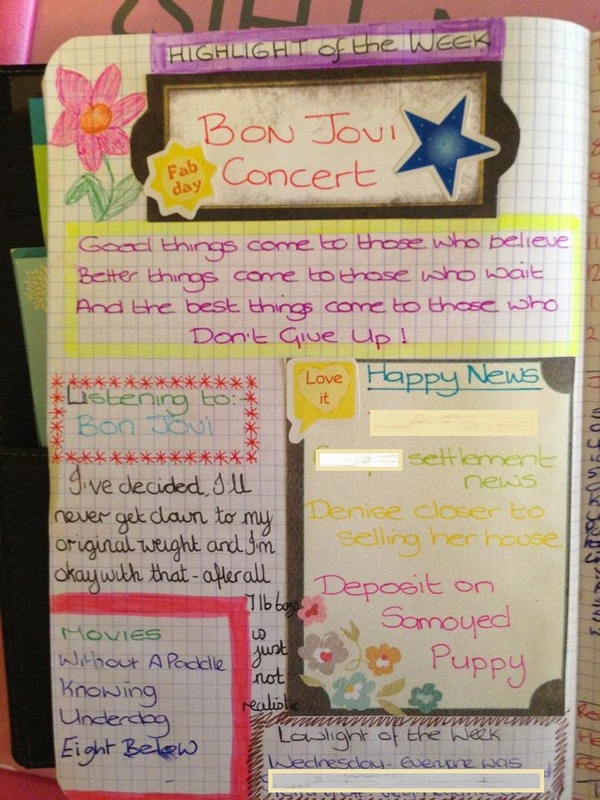 First thing I did, was get my Bon Jovi Concert page transferred. Newspaper review, with my own review underneath. Then I added a few other bits. I dedicated this page to my dad. This is going to be the "Things I Love" page, it's still a working progress! All written in shades of green. And this is the weekly page, I spent hours doing this on Sunday night. I do one of these every week, it gives me a round up of the week. (Still need to fill in the right hand side). Last weeks entry in my A5 notebook (I later glued this page into the MS Journal. This Journal is big enough to hold my Daily Journal in. Now, fingers crossed, this set up will work for me! Let me know how you journal, what works for you? What things do you add to your own journals? Please share, I am always looking for new ideas to add to my own books. P.S. My apologies to anyone who spells Journaling with two L's. I can never decided which is the correct way! Journaling or Journalling?? ?